Finding the perfect bedtime story can make all the difference as toddlers and preschoolers settle down for the night. 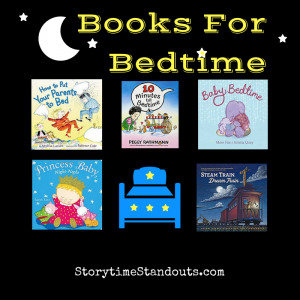 In this post, we have a look at some delightful bedtime-theme children’s books that will set the tone for a good night’s sleep. In the comments, we hope you’ll let us know about your favorite books for bedtime! 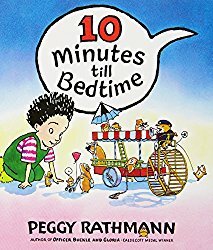 In this classic, fun picture book, Dad cautions his son that it is 10 minutes till bedtime. Within a moment, a pet hamster has summoned other neighborhood hamsters to stop by for ten minutes of fun. Preschool-aged (and older) children will enjoy the detailed and engaging illustrations that tell most of the story. Of course, the joke is on Dad as he has no idea what is happening behind his back, as his son gets ready for bed. Good fun and a great opportunity for language and comprehension development. Carefully ‘reading’ the illustrations and talking about what is happening is a big part of this bedtime story. 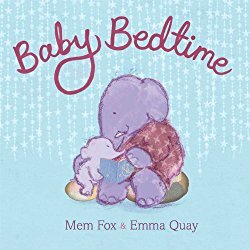 Soft tones and sparse, rhyming text are hallmarks of this gentle picture book about a baby elephant’s bedtime. Cuddling and smiling, an adult elephant takes a baby elephant through a bedtime routine (including a story!) before finally saying goodnight. One of the really lovely aspects of this picture book is that the gender and age of the adult elephant is not specific. This could be a mom, dad, grandparent, aunt or uncle putting the youngster to bed. Wonderful rich vocabulary and onomatopoeia make this a wonderful bedtime story for preschool-age and older children. Children who are interested in trains, will enjoy hearing the names of the various cars (hopper, tender, reefer, gondolas etc.) and will hear the rhythmic text that echoes the sounds we associate with steam trains. Set in moonlight, Mr. Lichtenheld’s illustrations, created with wax oil pastel are beautifully atmospheric. We especially liked the train’s arrival and the child’s moonlit bedroom. 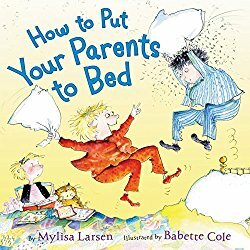 Preschool-age and older children will enjoy the humor as a young girls tries to get her parents to go to bed. Chores, a computer, games, television and even cell phones are delaying mom and dad’s bedtime but, with determination, it is possible for her to get them settled and off to sleep. Older children, especially those who resist shut-eye, will see themselves in this fun role-reversal tale. Getting ready for bed can be an exhausting proposition. Princess Baby has lots to do. She not only puts her own pajamas on, she dresses her six special friends for bed too. She also helps with washing up, brushing teeth and selecting stories. Bright, beautiful collage illustrations make this a great story to share in a group setting. 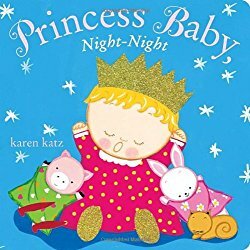 Fans of Princess Baby will want to explore Princess Baby and Princess Baby on the Go . When my sons were young, they loved picture books about vehicles. Whether reading Richard Scarry’s Cars and Trucks and Things That Go or Diane Siebert and Byron Barton’s Truck Song, my boys loved stories about emergency vehicles, trains, construction trucks and farm equipment. We would admire the interesting vehicles we saw while out on the road and check them out more closely when they were parked. 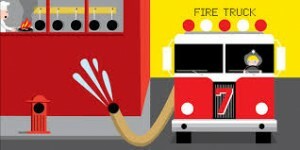 On more than one occasion, I recall walking around big rigs – cement trucks and fire engines were especially appealing. 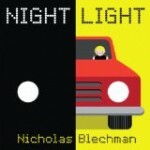 Night Light is a picture book my boys would have loved! Bright, colorful computer-generated illustrations include a zooming train, a hovering helicopter, a shiny taxi, a chugging tugboat, a hard-working loader and a gleaming firetruck. All have lights that shine in the dark. Youngsters will enjoy counting the lights, hearing clues and then speculating on what vehicle’s lights are glowing through the die cuts. As well, they will enjoy looking at the flip side of the die cuts and how Blechman incorporates the black circles they create into the left side of each spread. Do you know which vehicle has three lights shining late at night or what sort visits many sites? 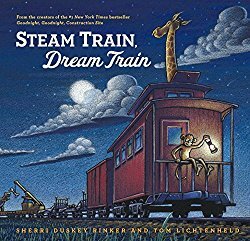 Whether enjoyed as a counting book or as a part of a transportation theme, Night Lights is best-suited to preschool or kindergarten age children. It could also be used as inspiration for older children, prompting an exploration of art techniques that incorporate the magic of die cuts. Some reviewers have commented about the final illustration of the book. It is printed on the end papers and, when the book jacket is in place, it is partially obscured. Similarly, at the front of the book, the book jacket covers the publishing details enhancing the look of the first pages. While perhaps not ideal, this does not detract from the appeal this story will have for transportation enthusiasts. Night Light has been nominated for a 2013 Children’s and Young Adult Bloggers’ Literary Award. I have written previously of my younger son’s fascination with picture puzzles. When he was four or five, he would spend countless hours searching for objects and noticing small differences between pictures. He loved to have a picture puzzle book as one of his bedtime stories. He is still a fan of puzzles and is very attentive to small details. Picture puzzle book are wonderful for small children, they encourage kids and adults to slow down and take time to enjoy illustration. They demand that readers pause to examine and appreciate illustrations rather than turn the pages quickly. They also encourage concentration and attention to detail. I am a big fan of Walter Wick’s work and have shared many of his books with children. Can You See What I See? Toyland Express takes this genre to a new level as it introduces a picture-narrative to the usual puzzle format. We begin in a woodwork shop and can almost smell the woodshavings and sawdust. It is clear that a skilled craftsman is at work, creating train parts and other intriguing toys made from wood. Turning the page, the woodworker’s creations have been shifted to a large paint shop where bright colours are added to an amazing array of toys and toy parts. Once painted, assembled and boxed, the Toyland Express – a cheery toy train – is prominently displayed in a toy store window, hoping to entice a buyer. Sure enough, the train, track, bits of scenery and characters become a treasured birthday gift for a young child. One can almost imagine the squeal of delight when the gift is opened. Eventually, the well-used train set is stored, with other discarded toys, to gather dust. All is not lost, however. A yard sale and refurbishment are just around the corner for the Toyland Express. Before long, the train is happily chugging through a new, modern world, consisting of blocks, paper, dominos, cars, boats and other toys. 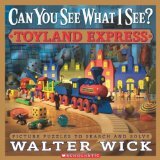 Sure to captivate puzzle-solvers as they search for hidden and disguised objects, Toyland Express encourages imaginative play and delivers a “green” message. It may send readers scrambling to discover treasures at a neighbourhood yard sale or encourage children to consider the steps involved in creating toys. 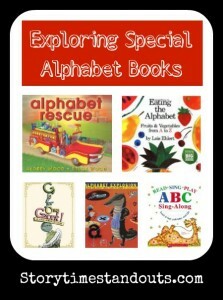 Having an alphabet book (or two, three or four! 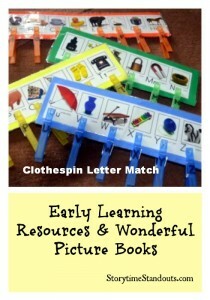 ), is one way to make your home literacy-friendly. 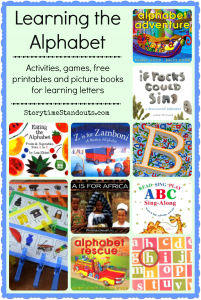 Today I will look at five diverse alphabet books… Just looking at the titles and cover art gives us a hint of the broad range of style and content that alphabet books can encompass. 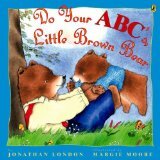 Beginning with Do Your ABC’s, Little Brown Bear we discover a way to help a child learn her alphabet. On a walk with Papa, Little Brown Bear looks for things that begin with each letter of the alphabet. I enjoyed the sweet interaction between Papa and Little Brown Bear. 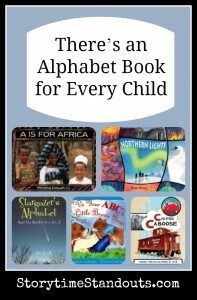 It is hard to imagine any family sharing the book without embarking on their own alphabet exploration. Appropriate for children aged three and up. Northern Lights A to Z will appeal mainly to older children (aged five and up) particularly those who have a special interest in the night sky or legends. Beautifully illustrated, the author seamlessly mixes science and myths and shares her knowledge in an engaging, accessible format. I can still remember the emotions I felt when I saw the aurora borealis. This special alphabet book captures the extraordinary experience beautifully. A Is for Africa features gorgeous photographs of people and things found in south-eastern Nigeria. Best for children aged five and up, I was struck by the author’s respectful tone and the way her photographs draw us into the atmosphere in the community. Although written in an alphabet book format, one can easily imagine an older child using this book to learn about life in an African village. When my boys were young, books about trucks and trains were very much “top of the charts” as far as they were concerned. C Is for Caboose features a mix of bright, bold illustrations and archival photographs. This will appeal most to children who are already fascinated by rail travel and enjoy historical photographs. For older children (aged six and up), Stargazer’s Alphabet is “out of this world.” Featuring fabulous photographs of the Milky Way, Jupiter, Mars and more, this book uses a terrific format to its best advantage. Large pages each feature a rhyme: “V is for Venus, a lovely dazzling disk“, a factual paragraph plus photos, maps and diagrams. Great for families where the youngest child can enjoy the rhyming text and older children (and adults) can read detailed explanations. Featuring a glassary and the author’s thoughts on space, the breadth of the material covered will make this a valuable family resource for many years.